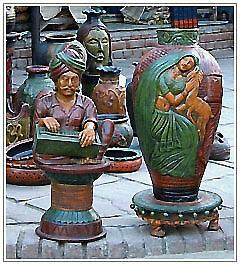 Delhi artists who have migrated from different parts of the states produce traditional terracotta craft in the most traditional way. A variety of earthen objects such as cut-work lamps, money banks, flower vases, pots, kitchen wares, musical instruments, and many more items are made here. Multi types of clay are used in making these articles which are mixed and dried. Each item is given a shape after which it is shifted to the locally made ovens for the ready effect.